Here is the start of my layout, with photos and title in place. These pictures are quite colorful, so I don't feel a need to embellish heavily. If I add a subtitle, I won't need space for additional journaling. This page is all about the close-ups of the flowers. A few stickers, brads and some stitching and this layout is finished enough for my taste. How is this different from a grid? Really, the two are quite similar and interchangeable. The dominant 3x4 size, corner rounding, lack of layering and filling the page pushes me in the direction of thinking Project Life. Using Project Life style on a traditional 12x12 scrapbook page seems to be a newer trend. I like it and have a Pinterest board full of ideas. Do you do Project Life? 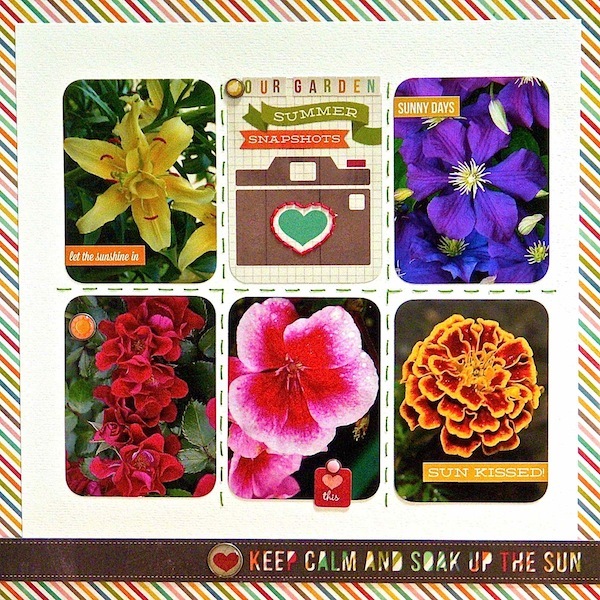 Have you ever tried translating the style to a regular scrapbook layout? Those photos are amazing! & your layout is super! Love it! Great layout! I definitely have to give this design a try! Beautiful photos! Love the stitching and the filler card you chose is perfect. beautiful!! Love the grid design ~always a winner! Gorgeous photos! ;) I really love PL, and made a vacation album and my December Daily in the style last year to test out whether I could pull it off. So far, I love how the weekly layouts are coming! :) And yes, I apply the same philosophy to regular layouts (grid styles). Wow, those photos are amazing! I love the rich colors on the layout and the border with your title is awesome! This is a fave! Really great take on the PL style, Sue!! Those photos are gorgeous and I love that you rounded the corners! This is such a nice idea! 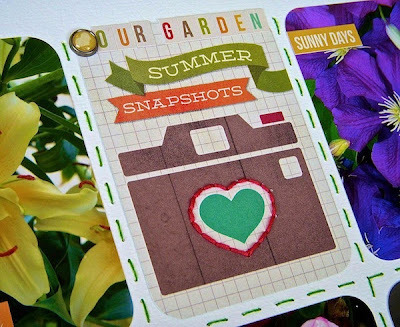 I need to do this with the photos I took of mum's many geraniums! Thanks for sharing! Like how you rounded all the corners and the stitching between photos. A perfect showcase for flower closeups. 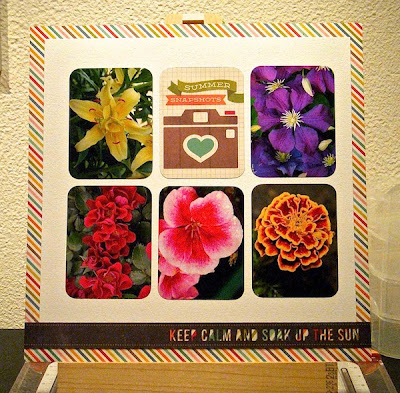 Cute layout and beautiful picts of the flowers. Great photos and the page design is neat. 3 New Design Classes + Coupon Code!